After a hot summer of routine duty in the Hampton Roads area, Monitor badly needed an overhaul. This work, done at the Navy Yard in Washington, D.C., fitted the ship with a telescopic smokestack, improved ventilation, davits for handling her boats and a variety of other changes to enhance her fighting power and habitability. She returned to the combat zone in November 1862, remaining in vicinity of Newport News for the rest of that month and nearly through the next. In December, Monitor was ordered south to join the blockading forces off the Carolinas (see USS Monitor: Homepage). After preparing for sea, on 29 December she left Hampton Roads in tow of USS Rhode Island, bound for Beaufort, N.C. The weather, expected to be good for the entire voyage, stayed that way into the 30th, as the two ships moved slowly along, several miles off the North Carolina coast. However, wind and seas picked up during the afternoon and turned to a gale by evening. The Monitor labored heavily as she neared Cape Hatteras, famous for its nasty sea conditions. Water began to enter the ship faster than the pumps could expel it and conditions on board deteriorated dangerously. Shortly before midnight, it was clear that Monitor was in grave danger. Her steam pressure was fast failing as rising water drowned the boiler fires. The tow line was cut, the anchor dropped, and distress signals were sent to the Rhode Island. Boats managed to remove most of the ironclad's crewmen under extremely difficult conditions, but several men were swept away. Finally, at about 1:30 in the morning of 31 December 1862, the historic Monitor sank, to be lost to human sight for nearly 112 years. Sixteen of her crew of sixty-two were lost with her. (Picture) "The Wreck of the Iron-clad Monitor." 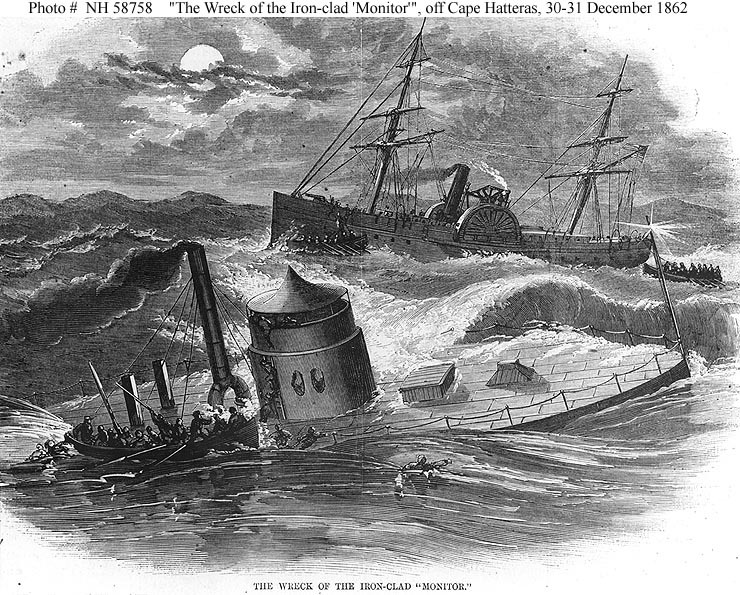 Line engraving published in "Harper's Weekly", 1863, depicting USS Monitor sinking in a storm off Cape Hatteras on the night of 30-31 December 1862. A boat is taking off crewmen, and USS Rhode Island is in the background. U.S. Naval Historical Center Photograph. (Picture) USS Monitor (1862). Photographic mosaic of the ship's remains, composed of individual photographs taken from the research ship Alcoa Seaprobe in April 1974, when Monitor's wreck was initially discovered. Monitor lies upside down, in badly damaged condition, off Cape Hatteras, North Carolina. In this image, her bow is to the right, with her turret displaced and visible in the lower left, with the hull resting atop it. U.S. Naval Historical Center Photograph. Further technological advancements were included in subsequent monitor designs, and by the end of the war the US Navy possessed a modern coastal fleet carrying the most powerful artillery afloat. This book covers the design, development and operational history of the Union’s Monitor fleet.